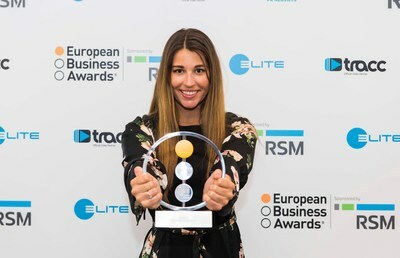 LONDON, March 20, 2019 /PRNewswire/ -- The 2019 European Business Awards is now open and calling all successful businesses to enter and get the recognition and global exposure they deserve. Companies can enter for the opportunity to win in one of 18 categories. As well as global recognition, other benefits include networking and new business opportunities, increased brand exposure and inclusion in an influential business community. Adrian Tripp, CEO of the European Business Awards, said: "The European Business Awards recognises the drivers, innovators and game changers: the successful businesses that look beyond their own desks and office blocks to make a difference to the world. If that is you then enter today." He continued: "The Awards exist to develop a stronger, more successful and more ethical business community in Europe because we believe that businesses play a key role in tackling major global issues such as unemployment, climate change and widespread poverty." The European Business Awards is one of the world's largest and most prestigious independent cross border, cross sector business competitions. It analysed over 111,000 companies from 34 countries in last year's competition alone. This year the Awards is also pleased to announce award winning private equity firm, Inflexion, as the new sponsor for its Entrepreneur of the Year Award. Andrew Priest, a Partner at Inflexion said: "We are honoured to sponsor The European Entrepreneur of the Year Award, which recognises the vision, talent and tenacity of Europe's vibrant community of entrepreneurs." As well as a robust, transparent competition, The European Business Awards runs in-depth research, alumni groups, conferences and webinars to give leaders from different industries the opportunity to learn, share and solve major challenges. Adrian Tripp said: "We understand the power of networking and bring together the movers and shakers from multiple sectors all under the same roof." This year the competition has a three-stage process. Following entry, the Awards will publish its "Ones to Watch" list of the most successful, innovative and ethical businesses from each European country. After further judging, 18 National Winners in each country will be announced in September (one National Winner for each category), and then in December 2019 the final 18 European Winners will be announced at a high profile two day Business Summit and Awards Gala Dinner, bringing together over 700 of the most successful and influential businessesin Europe. The European Business Awards is one of the world's largest and most prestigious cross border, cross sector business competitions. Since 2007, it has been rewarding the most successful, ethical and innovative businesses across Europe; businesses of all sizes that are a force for social good and making a difference to the world we live in. Our primary purpose is to support and develop a strong, successful and more ethical business community as we truly believe businesses play a key role in tackling major global issues such as unemployment, climate change and widespread poverty. The European Business Awards is now in its 12th year. Last year it considered over 111,000 businesses from 34 countries. Sponsors and partners include Inflexion, ELITE, Germany Trade & Invest and PR Newswire. About Inflexion: Inflexion is as an award-winning mid-market private equity firm, investing €10m to €250m for a minority or majority stake across all sectors. About Germany Trade & Invest: Germany Trade & Invest is the economic development agency of the Federal Republic of Germany. The company helps create and secure extra employment opportunities, strengthening Germany as a business location. With more than 50 offices in Germany and abroad and its network of partners throughout the world, Germany Trade & Invest supports German companies setting up in foreign markets, promotes Germany as a business location and assists foreign companies setting up in Germany.